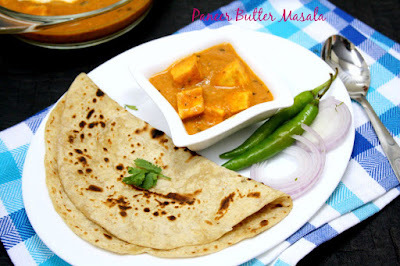 Cooking 4 all Seasons: Paneer Butter Masala, yet another form! For the final week of BM#55, I picked up to do Bookmarked recipes. I know everyone would be having endless bookmarks, and with each edition of BM, my list grows bigger and bigger. Infact it has become so bad that I hardly ever refer my physical cookbooks. That's why I make sure I do the Cooking From Cookbook challenge. Anyway coming to this week, picking up just three was so hard. So I went by what I feel is the best I can do. I picked up three that my kids enjoyed/ I knew they will enjoy! First in the series is a classic rich Paneer Butter Masala from Padma. Padma had invited us for dinner along with few other BM members. I had taken my family to meet them all. So wanting to ensure the kids eat, she called up to ask what they like. 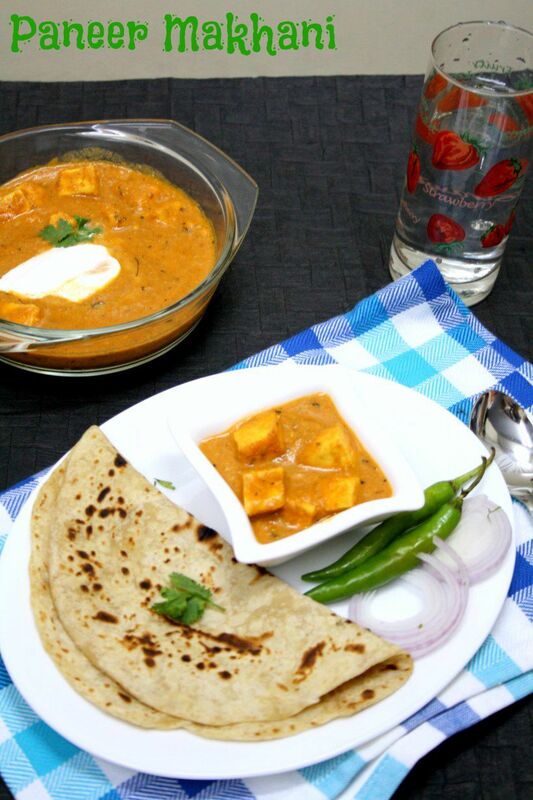 I said what else, but paneer! I also said she should keep the menu very simple knowing it is going to be talking more eating less gathering. 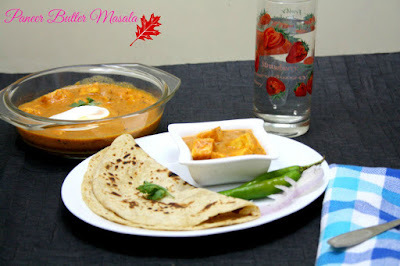 Even then she had prepared quite a menu, and I remember she saying her next day cooking was also done..:) Anyway back to the dish she prepared, needless to say my kids loved it, so much that the next time I was supposed to make it, they only wanted Padma Aunty's Paneer Butter Masala. So my next stop was to check out the recipe and shared with Amma as well. Since then we have been regularly making this version as well, apart from our usual ones. Wash and make a cross slit on the tomato tops. Bring a cup of water to boil, add the tomatoes. Simmer for 5 -7 mins. Once cooled, peel off the tomato skin and chop fine. Cook these chopped tomatoes along with rest of the ingredients for 2 -3 mins. Once done, cool. Then grind to a smooth paste and strain through a colander. This puree can be refrigerated for a week. Dry roast the coriander and cumin seeds till they crackle, ensuring they don't get burnt. Cool and grind to a fine powder. This can be stocked as well. If using store bought paneer, cube and soak in hot water, squeeze well. Roast in ghee till it turns golden. If using homemade, cube and roast directly. Boil cubed onion pieces in a cup of water. Drain and cool the onion. Reserve the water for the gravy. Once cooled, grind to a smooth paste. Dry roast Kasuri Methi and crush with your hand and keep it aside. Hat butter in a non stick pan, add onion paste and fry till light brown color. Then add ginger garlic paste and stir for a min. 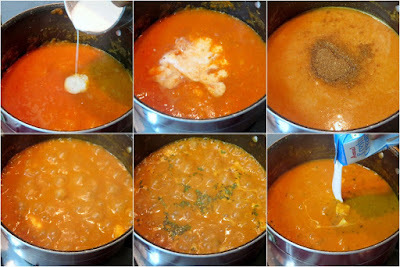 Now add turmeric powder, red chili powder, coriander and cumin powder, garam masala powder and mix well. 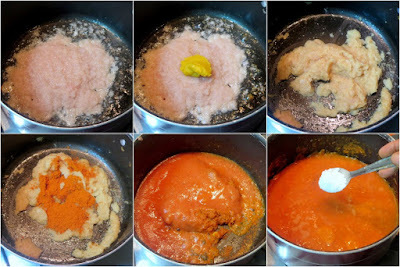 Simmer for couple of mins, then add cashew nut paste and tomato puree, salt to taste and cook till butter leaves from the sides of the pan. This takes about 10 mins. 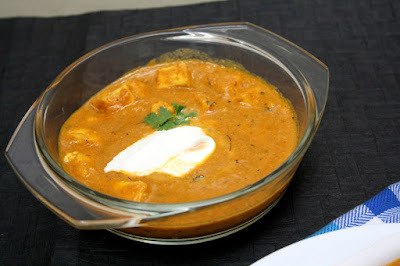 Next add paneer cubes mix well, then add cream, Kasuri methi mix well and cook for 2 more min. and remove from the heat.